Two presidents boasted about the strength of the American economy this weekend, each claiming credit for the steady growth and declining unemployment as President Donald Trump seeks to parlay the nation's economic success into a winning midterm message for his embattled party — and former President Barack Obama reminds voters just when the boom began. 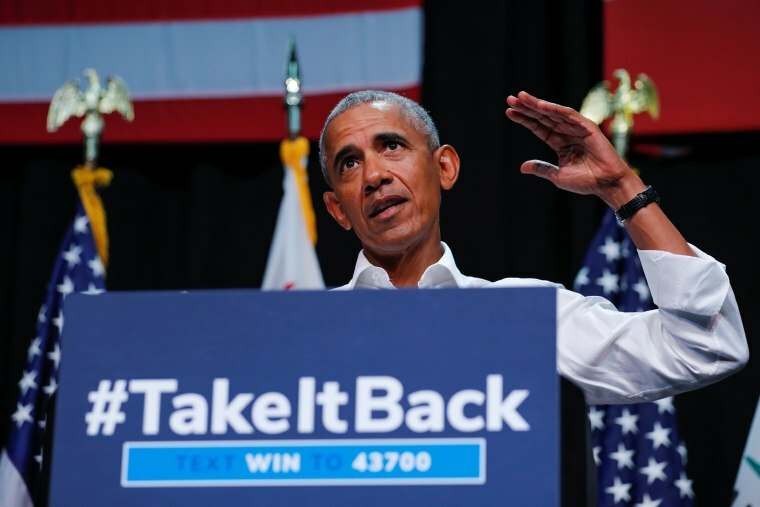 "When you hear how great the economy's doing right now, let's just remember when this recovery started,” Obama said on Friday in a speech that marked his first foray into the upcoming elections. "I mean, I'm glad it's continued, but when you hear about this economic miracle that's been going on, when the job numbers come out, monthly job numbers, suddenly Republicans are saying it's a miracle. I have to kind of remind them, actually, those job numbers are the same as they were in 2015 and 2016." Fact check: Did Trump pull off an economic turnaround? The economy's success or failure depends on much more than who sits in the Oval Office, but let's take a look at the facts here. Absolutely not. Trump inherited a booming economy with low unemployment and steady job growth — an easy win on day one — and he quickly claimed credit. Early in his presidency, Trump boasted about job gains starting from his election onward, crediting Obama's final months as his own. Trump's supporters say he's supercharged the economy. Now in the second year of his presidency, he has passed a major tax bill and rolled back a significant number of regulations, giving the economy another injection of capital — though economists disagree on the how much the tax cuts will really benefit the larger economy and whether it will have lasting effects to the economy. Economists aren't buying it: While the tax cuts probably helped inject some cash into the economy — particularly the stock market — the country has largely maintained the growth it saw under Obama. The numbers Hassett touted, economists said, were cherrypicked to show a trend that economists say they're just not seeing. The U.S. added more jobs than expected, but what about wages? Multiple news organizations had fact checked the president's statement earlier in the day, and found "100 years" to be false. This type of relationship between the GDP and the unemployment rate had not happened in 10 years, Hassett confirmed in response to a question from a reporter. "You'd have to talk to the president about where the number came from, but the correct number is 10 years," Hassett said. Trump has yet to correct his tweet. Still, it's impossible to tease out Trump's economy from Obama's this early in the former's presidency. GDP last reached 4.2 percent during Obama's second term. And where workers are concerned, Trump's gains do not yet match his predecessor's. Since Trump took office, the country has added 3.58 million jobs, short of the 3.96 million jobs that were added in the final 19 months of Obama's presidency. Economies do not grow overnight, or turn on a hair with a new presidency. While Obama can look back on his eight years and see his leadership play out, Trump's effect is still not yet known. "In my view, the [Trump] effects are going to be much longer term — we shouldn't be looking at these indicators right now, which is just kind of a continuation," Harvard economist Marc Melitz said, citing tariffs and renegotiated trade deals as a top concern down the line. "It’s going to generate a lot of instability. Already you can see some of it in terms of higher prices for a lot of materials in the U.S."